The Alzheimer Society, Canada’s leading nationwide charity for people living with Alzheimer’s disease and dementia and Ramp Communications, a marketing and communications agency dedicated to sharing positive stories, created an impactful campaign to raise awareness of the difficulties of dementia and reduce the stigma attached. Stigma is a major barrier that can prevent people who live with dementia from living well. This campaign aimed to highlight the humanity that is part of every person living with dementia, converting judgement into compassion, and assumptions into understanding. Nationwide research found that stigma and negative attitudes towards dementia persist, with 46 per cent saying they would feel ashamed or embarrassed if they had dementia, and 61 per cent believing they would face discrimination of some kind. Telling the stories of the humans behind the disease was key to the impact of this campaign. Research findings were issued to media, supported with real-life stories of ‘Voices’ of the campaign – people living with dementia at various stages of their lives. 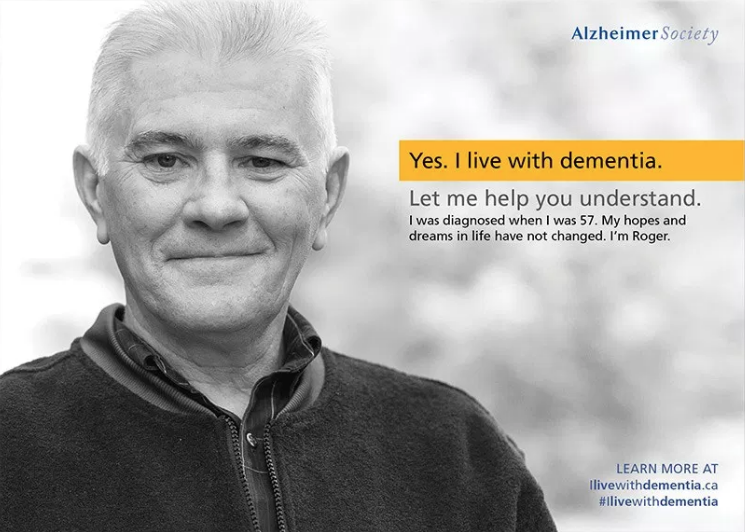 A microsite was built to house these stories, featuring bold, impactful visuals alongside the simple campaign tagline: ‘Yes, I live with dementia. Let me help you understand.’ with information for readers on how to approach and deal with the the topic of dementia. Digital advertising, social media, and earned media created a nationwide call to action promoting the microsite, and local Alzheimer’s societies were invited to participate, receiving a toolkit of customizable assets such as postcards, posters, and social media content to share the story. As the campaign grew, more local “Voices” were added to the microsite, meaning Canadians from across the nation were represented. Throughout the month, the microsite had 23,700 new users, the hashtag #ilivewithdementia earned 2,074,624 impressions, and the Facebook page earned 48% more new likes than it did the previous year. There were 4,670,418 paid digital impressions and 248 earned media placements, and Facebook ads had over 8000 clicks and 336 shares. Alzheimer’s Awareness Month 2019 is approaching and the campaign will continue, building on its impact to further educate, raise awareness and reduce stigma to help people living with dementia, live well.